How long does a mutual fund transaction take? Last week was a crazy week for the stock market (it feels like they all are recently). And since you might be reading this a few weeks or months after the fact here is a nice little summary from Forbes.com. On Monday August 8th, 2011 – the first trading day after S&P’s downgrade of the United States’ credit rating – the S&P 500 index lost a whopping 6.7%. On Monday night, after catching up on the day’s stock market news I had two thoughts: 1. SELL EVERYTHING NOW! and 2. BUY MORE STUFF NOW! How long does a mutual fund transaction take? Mutual funds differ from regular stocks in that you can’t buy and sell mutual fund shares instantaneously during the day. Mutual fund share prices do not fluctuate throughout the day. Instead, their share price is calculated once at the end of every trading day. This is due to the fact that mutual fund prices do not reflect investor perceptions, but rather a simple accounting of the fund’s actual Net Asset Value (NAV). As a result if you click the “Buy” button at 10:00AM on Monday morning, your transaction will not be processed until the market closes at 4:00 PM Monday afternoon. In addition, the price that the mutual fund is listed at when you start the transaction will probably be different than the price you will eventually pay at the end of the day (because the NAV will be recalculated at 4:00PM). The bottom line is, no mater when your mutual fund transaction is initiated, it will be processed the next time your clock reads 4:00:00 PM. I’ll use the actual scenario that occurred last week as an explanatory aid. As you may already know, I am the proud owner of a Vanguard Target Date Fund. I’ve included a screenshot of the chart for my fund (VFIFX) spanning the last 20 or so days, including the crazy last week. On Monday, August 8th, around 10pm (after the trading day closed) I initiated a transaction to buy more shares of VFIFX – when it was listed at about $19.25 a share. At 4:00 PM on August 9th – when my transaction should have been completed – the price was about $20.00 a share. This means that because of the mutual fund transaction delay, I would be getting less for my money than I would have if I managed to buy the shares before the close on Monday. Fortunately for me, my transaction took a day longer. Because I don’t keep any money in my vanguard account (besides what is in the VFIFX fund), when I clicked “Buy” I was actually initiating a transaction to transfer money from my checking account to the vanguard account and then to buy mutual fund shares. As it turns out it took a day for the money transfer to occur (this may take longer/shorter with your specific accounts), which meant I bought shares at the close of Wednesday August 10th. 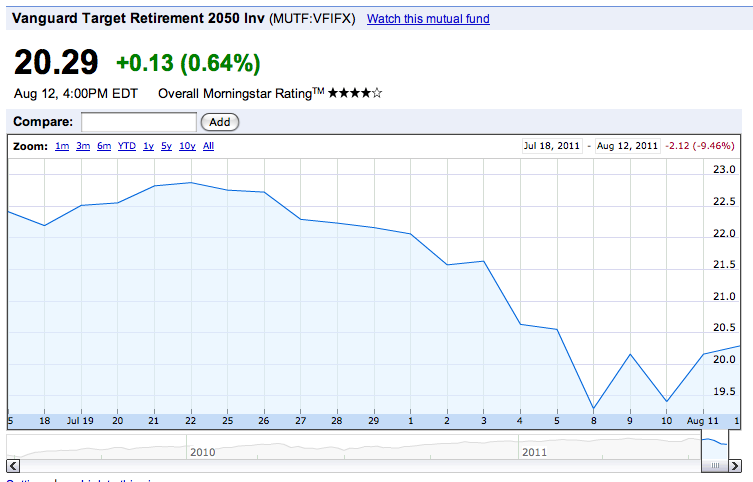 Why do I care how long it takes me to buy a mutual fund? The answer is that you shouldn’t. If nothing else, last week’s experience was a good reminder to me that investing in mutual funds (and retirement investing in general) is not about timing the market. It is about putting money in your account consistently, trusting the market’s historical performance, and not worrying about market fluctuations. But, just in case you find yourself trying to get an edge by buying mutual funds on a downswing, it is important to know beforehand how long your transactions take. This way you can properly assess the risks associated with the transaction time delay. I know that this is not a post with ground breaking investment strategy, but it took me long enough to find this information on my own that I thought it was worth sharing (and writing down for my own future reference).